I’d like to know who the first photographer was that got the brainstorm to pair a gorgeous model with a snake around her neck. Aside from the fact that I am not a model, I’m not sure I could stand being photographed with a gummy worm around my neck. However, our Snakes are a little bit different. I am so brave that I will actually pick and handle our Snakes! At Halstead, there are lots of Snakes to choose from. Handle. Drape around your neck. Even be photographed with! 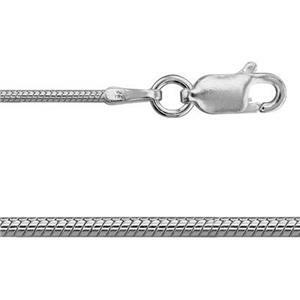 One of them is the 2SN120 – a 20 inch finished 1.2mm Snake Chain with Lobster Claw. First Step 20 inches – Second Step 24 inches! Love this chain. It's a little thicker than my other two favorites (2SN916 and 2SN918), which is perfect for larger or heavier pendants. I also love the lobster claw closure on this one. Those are great. Definitely recommend this - great value and price.